INGREDIENTS: 100% natural, wild harvested, organic grade, cold pressed by wooden press Cedar Nut Flakes. May contain cedar nut film a rich source of silicone. Rich source of Natural Protein. 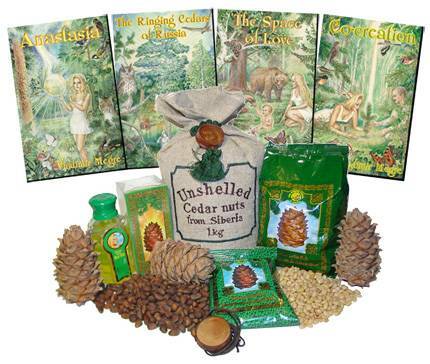 A variety of high-quality cedar products, including cedar nuts, cedar flakes and cedar nut oil. Huge plantations of cedar trees grow in the Siberian taiga, said to be the ecologically purest area of the world. The virgin forest of the taiga has never been treated with any chemicals or artificial fertilisation, nor abused by agricultural machines. We pick only cedar cones which fall naturally from the trees, thus ensuring that only ripe cones are selected. We always avoid hitting the trees to shake unripe cedar cones down (as happens with some other commercial operations) - a practice which causes the nuts to lose their healing power. Cones are then manually shelled with the help of wooden shell-removers. Nut centres are separated from their shells using wooden rollers. 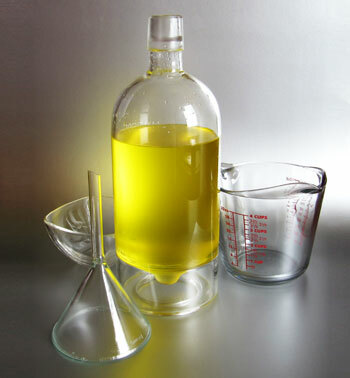 Cedar nut flakes marketed under our brand name is obtained by the cold-pressure method, using manual wooden oil-presses. Special steps have been taken to protect "THE RINGING CEDARS OF RUSSIA" cedar nut flakes against counterfeit. Each box has a holographic label with a unique number attached to the side. The unique number can be veryfied at our "anti-counterfeit" page or through the e-mail address anti-counterfeit@energyoflife.ca. 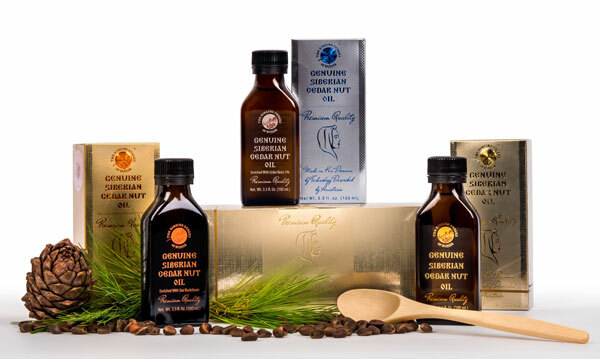 Ringing Cedars of Russia Company is happy to introduce you the family who makes the Siberian cedar nut oil and cedar nut flakes in their own Space of Love in Kin's Domain. Our family consists of four persons: Eugen, the head of the family; Nadezhda, his constant and faithful support; and Anna and Dimitry, their two talented and intelligent children. Until 2008, we lived outside of Russia, in Germany, where we went in 1999 to live permanently. We were seeking a better, more peaceful and happy life. We lived there for nine years, but our happy future moved further and further away from us. We began to analyze our past and present. We reappraised many things and our values. Our way of life at that time did not suit us at all. A great desire awakened to move to Russia and live on the land. But we still had no confidence that our decision would change anything for the better. But some time later, the Ringing Cedars of Russia books fell into our hands. As we now realize, it was not by chance. Reading the books was a turning point for us. Once we discovered the answers to a multitude of questions, there came an understanding of everything that had happened. We were seized with the desire to change a great many things as quickly as possible and simultaneously to find our own place on the land and settle down there forever. Since we were born in Siberia (Tomsk Oblast), these areas were nearest and dearest to us. After a short search of kin's estates, we happened to come across the organizers of the Solnechnaya Polyana settlement. That same summer, we took our holidays and went to resolve the matter of a parcel of land. Our request was approved, and several options of unoccupied parcels were suggested to us. One of these appealed to us more than the others: a field with various grasses and nothing else. This was the "blank canvas" on which we were destined to create a space to be our home. In March 2008, we made the definitive move from Germany to Tomsk and began to set up our Kin domain. We built a small house and bath-house. In the spring and summer, we are busy with planting, and in the autumn we collect a harvest of vegetables and some berries; in the winter we make plans for the future. Since in our area there are many wild berries and cedar forests and taiga, and we ourselves are great nature lovers, we decided to get involved in the harvesting of cedar nuts, thus benefiting others and receiving enjoyment from our work. For us the domain is a space of love and a living environment with clean air, water, and food. With its abundance, it guarantees our family self-sufficiency, and will provide the opportunity and time to engage in creative activities. And the very creation of the domain is already our joint creative venture, in which we all participate, and each reveal ourselves in our own way. Now, as we set up our domain, we feel completely that we are overflowing with wonderful bright feelings; we want to bestow our love on everyone. When you are in our domain, you truly enjoy life; this we have felt ourselves. Living at the Kin Domains in the Space of Love we understand simple truth that we want to create the best quality products. We considered all advices from Anastasia and created same Siberian Cedar Nut Oil which she prepared for Vladimir. We also developed the highest quality packaging. We took best available medicinal grade glass bottle from Germany. We decorated it with pure gold and packaged to the box with the design inspired by Anastasia. 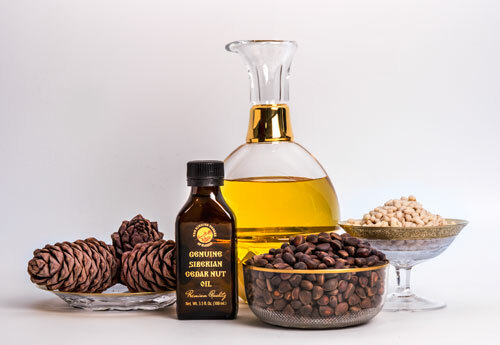 Please enjoy the World Best Cedar Nut Oil from Kin Domain! The flakes of the cedar nut are obtained by pressing the cedar nut oil from the kernel of the cedar nut. In contrast to the whole cedar nut, cedar nut flakes are distinguished by their increased proportional content of vitamins, trace elements, and plant proteins owing to the reduction of the fat content. In the processing of pressing the cedar nut oil, 10–16% of the cedar nut oil is retained in the flakes. The protein in the flakes made from the kernel of the cedar nut surpasses an ideal protein in its content of histidine, methionine, cysteine, and tryptophan, and has a well balanced composition. The carbohydrate composition of the kernel of the cedar nut is represented by polysaccharides (starch, cellulose, pentosans, dextrins) and watersoluble sugars (glucose, fructose, sucrose, and raffinose). According to the results of medical research, a similar protein facilitates the dissolving of harmful cholesterol in the blood, and also prevents the formation of cancer cells. The lecithin contained in cedar nut flakes is a basic chemical substance for the formation of the intercellular space, the normal functioning of the nervous system, and the healthy activity of brain cells. Lecithin is essential for the organism as a building material for the renewal of damaged cells. Lecithin is also the basic transport substance for the delivery of nutrients to the cells. Lecithin makes up 50% of the liver, 1/3 of the myelin insulating and protective tissues that surround the cerebrum and spinal cord. Lecithin is a powerful antioxidant and prevents the formation of highly toxic free radicals in the organism. Flakes made from the kernel of the Siberian cedar contain a high quantity of mineral substances—up to 5%, which are represented by a specific set of macroelements and trace elements. There is a high content of phosphorus and magnesium. Only 100 g of cedar nut contains the human daily requirement of magnesium, manganese, copper, zinc, and cobalt. Of special interest is the cedar nut as a natural source of iodine. The daily requirement of iodine is 0.1–0.2 mg, and the cedar nut kernel contains on average 0.577 mg/kg of iodine. 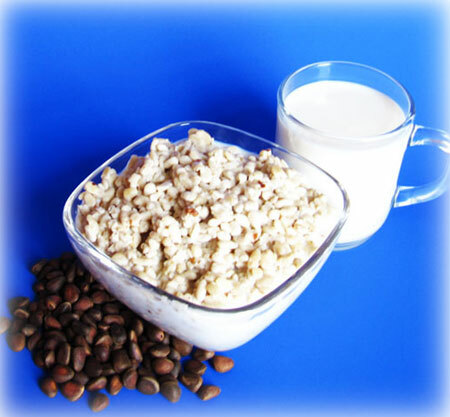 The importance of the flakes with regard to vitamins is characterized by the presence of fatsoluble and watersoluble vitamins, the most basic of which are vitamin F, the tocopherols, thiamine, and riboflavin. Cedar nut flakes should definitely be present in the food allowance of pregnant women, children, and breastfeeding mothers (for lactation). In olden times, when milk was completely absent, children were fed with a mixture prepared from cedar nut flour. Cedar nut flakes are natural protein, and are extremely suitable for athletes to increase muscle mass. The flakes have a pleasant nutty taste and aroma, are easily digested, and can include particles of the membrane of the cedar nut pericarp, which is rich in potassium. Cedar nut flakes are used as a complement to food (in porridge, salads), as part of flourbased confectionaries, as well as a separate food product. The consumption of 3–5 tablespoons of flakes a day fully provides the organism with essential components. 1. Fill the bowl with cedar nut flakes. 3. Add warm milk just to cover ingredients and stir. Add more milk if the mix seems too thick and stir again. Instead of milk you can add juice, maple syrup, kefir or yogurt. 4. Depending on the type of liquid you use, you may wish to leave cedar nut flakes for 1015 minutes to mesh well with it. 1. Cedar Nut Flakes Salad. In a large bowl mix together 1/2 pound romaine lettuce, 1/2 pound quartered cherry tomatoes, 1/2 pound sliced cucumbers, 1/3 cup cedar nut flakes and 1/8 cup finely chopped fresh basil. 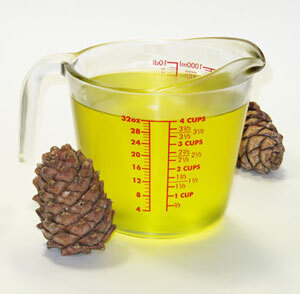 Pour 34 tbsp cedar nut oil and squeeze 1/2 lemon. Add salt to taste and toss well. 2. Tahini Sauce. Mix together 2 tbsp raw tahini, 1/2 juiced Lemon, 1tbsp Honey, 2 pressed garlic cloves and 2 tbsp cedar nut flakes. This sauce goes deliciously with crackers. 3. Protein Milk. Makes: 47 cups. Combine 1 cup cedar nut flakes and 35 cups water in a blender. You can create the desired thickness by using more or less water. Blend on high for 45 minutes. To sweeten add honey, bananas, dates, figs, raisins, maple syrup or your favorite fruit. Blend again until smooth. You can enjoy it thick or strain it through cheesecloth. Protein milk is perfect alone and with your meal. It will keep for 2 days in the refrigerator in a sealed glass container. Enjoy!